Aventinus — almost sounds like a character from Greek mythology, doesn’t it? Well, it is. But G. Schneider & Sohn apparently chose the name to honor Johannes Aventinus, a Bavarian historian and philologist who wrote an influential German history book. Will this info make the beer taste better? Only if you, like me, enjoy watching people’s eyes glaze over as you drop stun grenades of trivia at their feet. The label says “wheat doppelbock,” which sounds suspiciously similar to a weizenbock to me. As its pours, the beer initially exhibits a dark brown hue, but then a touch of light makes it glow like rubies encased in glass. The soapy white head provides a nice contrast, and a layer of foam rests at the top for the duration. I lift the glass to my nose and smell nothing but fruit. Sweet, ripe blackberries with raisins and caramelized bananas. The beer hits my palate screaming. Intense fruit flavors mask the 8.2% ABV, which leaves a tingling warmth on the tongue. I also detect some chocolate and spice — almost like spiced rum! The syrupy, full body strikes a pact with the creamy foam and the crisp carbonation, and the resulting textures make my mouth rejoice. And because this ale only comes in pint bottles, the rest of my body soon joins the festivities by falling down a lot. 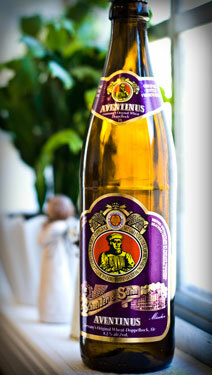 Aventinus is one of my favorite German beers. Hell, it’s one of my favorite beers, period. It blends the best of hefeweizens with the best of doppelbocks. Truly a wheat doppel if I’ve ever drunk one. And you should definitely drink one, too. I’ll be keeping my eye out for this one. Sounds brilliant. I would be interested in the average price for each featured beer. That’s a great idea. In fact, I might start including a stats list for each with info like price, ABV, etc … thanks for the suggestion! Sounds like I’ve got to try this one… Probably look for it at bevmo tonight. Great review too. I can’t wait to try this one! Thanks for the tip, Scott.